I find increasingly that living foods seem to pose a lot of questions and confusion to many of us not used to interacting with them. How do we start thinking effectively about living foods and our relationship to them? On the flip-side, wine snobs will tend to reject “clarified wines” as overprocessed — like the difference between distilled grain vinegar and a fine oak-aged wine vinegar. So, everyone wins if people can adjust their expectations accordingly: wineries can save time and money, and low-end wine consumers can get a better product for their money! Maya explains to Miles, the main character in Sideways, why she likes wine. I like to think about the life of wine. How it’s a living thing. I like to think about what was going on the year the grapes were grown: How the sun was shining, the rain…I like to think about all the people who tended and picked the grapes, and — if it’s an old wine — how many of them must be dead by now. I like how wine continues to evolve, like if I open a bottle of wine today, it will taste different than if I open it on any other day, because a bottle of wine is actually alive, and it’s constantly evolving and gaining complexity…that is, until it peaks. And then it begins its steady and inevitable decline. …And it tastes…So. F***ing. Good. 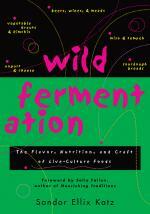 Sauerchi shares many similarities with wine (and beer; and yogurt, and fermented live-culture food in general). They also have many differences. I find it useful to think about the similarities between wine and sauerchi because, as Maya explains, they are both /alive/. However, wine has a more established place in our society. We can make the transition from dead/canned/pasteurized foods to living foods by thinking about sauerchi in similar ways we think about wine, and adjust our expectations of our food to better nourish ourselves. their “going bad” has little to do with danger and mostly to do with expectations and aesthetics (e.g,. wine turns to vinegar; sauerchi can develop kahm yeast [read about it here and here]; when it develops a heavy kahm yeast, it tends to exhibit cheddar-like flavors and textures, and I call it “sauercheese” and enjoy its different properties in this manner, with adjusted expectations). Wine gets fermented in a way to minimize the risk of vinegar bacteria development during its initial fermentation; but subtle and slow processes occur after bottling and during aging, opening and consumption that add to the wine’s complexity and aesthetics. Similarly, sauerchi gets fermented in a way to minimize the risk of kahm yeast in its initial fermentation, but subtle and slow processes occur during aging, jarring, opening and consumption that add to the sauerchi’s complexity and aesthetics. if left too long in warm or aerobic (“with oxygen”) conditions, wine and sauerchi both turn into different foods with different aesthetics and expectations and uses (wine turns to vinegar; sauerchi turns to sauercheese). I’m a living, breathing food. Please store me upright in a cool, dark location. Enjoy my many phases of life! This entry was posted in Announcements, Knowledge and tagged Cultures for Health, kahm yeast, living foods, Maya, Miles, Phickle, Rex Pickett, sauercheese, sauerchi, Sideways, wine on January 31, 2015 by ozob.